- We provide supreme quality of packaging polythene bags manufactured using advance technology and qualitative raw material. Our range of polythene bags is available in various shapes and sizes as per the specification and requirements of clients. Our high grade of polythene bags is ideal for packaging of an array of products. On offer from us is a premium range of Packaging Bag. These bags are manufactured using quality raw material and are also designed as per the specifications and drawings provided by the clients in terms of size and dimensions. We strictly test these bags on established norms for ensuring their durability and tear resistance features. We offer a range of BOPP Bags which is basically a polypropylene film and is considered as one of the most popular and high growth films in the world. Our BOPP bags are well received in the industry circle for their impeccable qualities and are used in the packaging of pet food, seed, animal feed, fertilizers and others. We are engaged in offering a wide variety of gift & complementary packing bags made from high grade quality raw material. These are extensively used by corporations and executive distribution gifts and by commercial sectors as complementary bags. Our wide range of gift & complementary packing bags are offered in specified customization byour valued clients. We are ranked amongst the best in the business and are engaged in presenting an extensive quality range of PP Packaging Bag to our customers. 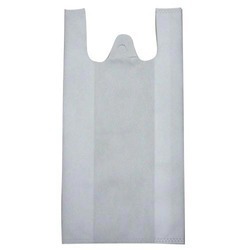 This PP Packaging Bag is extensively used as a shopping and promotional bag. Along with this, these products are available with us in varied sizes and prints.